House Shopping 101: Roof Ready? September 21, 2018. We are in for another wind event this afternoon. Is your roof ready? 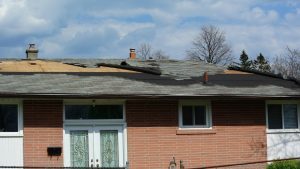 On April 4th and May 4th of this year we had wind events that caused significant wind damage to shingled roofs across the GTA. The 14 year-old Richmond Hill roof in the header photo is not doing very well. That is a South slope that was not visible from ground level because of orientation of the houses, and the tight distance between the houses. Despite the tender loving care this roof has received in the form of makeshift repairs, it will continue to lose shingle sections and pose a leakage risk. The steep slope of the roof is reducing the leakage risk, but probably it was leakage visible on the interior that prompted the owner to send someone up to risk life and limb and to wack little shingle pieces in to place and cover the exposed plywood. Roof shingles provide good value over their life, and its always advisable to have professional repairs and replacement done. There is no point in doing work as seen on this roof, just get the whole thing replaced. 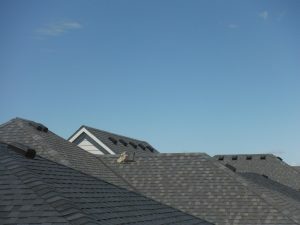 New construction shingles have a life expectancy of around 12- 18 years depending on quality of material, quality of installation, exposure to sun and wind, and attic ventilation. The second set of shingles will often be better quality material and installation and last 20 -25 years. Shingle warranties are of little merit when buying a house. There are too many exceptions to the warranties. So make sure your inspector has ladders or other equipment that will facilitate a full roof inspection. A drone is hit and miss depending on the weather, and most drone use in real estate and inspection is illegal. Getting up to the edge of the roof with the ladder will provide good information to allow the inspector to estimate remaining shingle life. 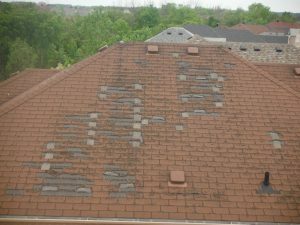 Professional roof shingle installation is important. The newer Scarborough roof shown in the photo was a victim of the May 4, 2018 wind event in Toronto. I did not inspect this roof, but there is a chance the nailing was not well done or the shingles did not adhere to each other. Once the lifting started, looks like the underlayment acted as a sail to catch the wind and lift multiple shingles. This is a West facing slope, the side that tends to catch the most wind in the GTA. Look closely at this photo. What do you see? I intentionally did not highlight the part bundle of leftover shingles on the ridge of this Oakville roof. This is about two years after construction is finished and owners have taken occupancy. Those shingles will sit tight through most weather, but in extreme wind events there is a risk they will blow off and could cause injury or damage. So, batten down the hatches and take care in the storm today. Keith Tripp lives, works and plays in Toronto, Ontario, Canada.